The Crusader AA Mk II is a Rank III British self-propelled anti-aircraft gun with a battle rating of 3.7 (AB/RB/SB). It was introduced along with the entire British tree line in Update 1.55 "Royal Armour". The driver's port at the driver's position offers up to 50 mm of protection in cast homogeneous armour. Default AP-T – HEF-I This belts carry an equal mixture of HET and APT. HET HEFI-T – HEF-I This is the belts you want to research first, since they are the best against aircraft. APT AP-T These are purely APCR belts that, as mentioned above, are not very useful with 40mm of penetration, it is always a good idea to carry a round of them for self-defence - It can knockout lightly armoured vehicles. Ammo rack of the AC Mk II AA (identical to Crusader AA Mk II). 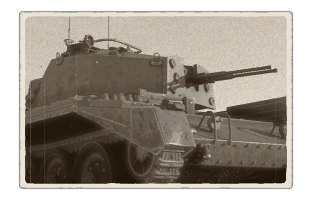 Though the Crusader AA Mk.II was meant for SPAA, the twin 20 mm cannons mean this vehicle can annihilate thin-skinned vehicles with ease, such as the 8.8cm Flak 37 or the M15, as the 20 mm will slice through the thin half-track armor to knock out the crew. 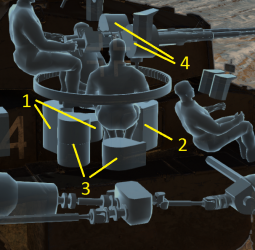 Due to the heavy ammunition consumption as SPAA in AA fights, stay at "safe" capture points to get free ammunition reload during battle. If forced to return to a cap point early in the game, this will often be a death sentence. This vehicle has multiple uses depending on which type of ammunition is selected. HET is recommended for destroying planes, but it would be impossible to destroy a tank with them. If such an encounter occurs, get out of the vicinity and do not draw the attention of tanks like the T-34-57 or Tiger will one shot this SPAA. When shooting planes try to aim for bombers and ground attack planes as they won't be able to outmanoeuvre the shots. APT rounds gives a lot more choices. Though it is a Rank 3 vehicle, the low battle rating means it will be matched against Rank 2 opponents, many of which won't stand a chance if shot from the sides with APT. If in a higher rank battle (with opponents like the Panther D and the IS-1), this tactic will often not work. However, the Mark II can still tear apart tracks and gun barrels just as easily with the APT rounds. As for the default belt, it is probably better off changing to prioritize HET or APT. Due to the relatively low ammo reserve, only take one type of belt with you and take as much you can carry as the ammo will run out quickly when it is split apart for both belts. 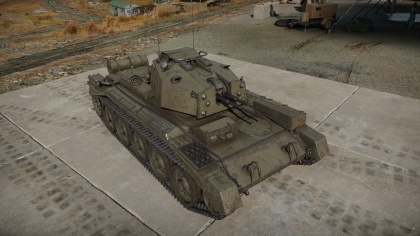 Due to the closed nature of the vehicle, the Crusader AA Mk.II doesn't need to worry about strafing fighters as they will often not do any serious damage to the crew. However, ground attackers like the Ilyushin or Thunderbolt are still just as deadly. Though more protected from machine gun fire, its armour is not enough to stand against enemy tanks, which would slice through the armour with shots from their cannons. Like every other vehicles, the "Parts" and "FPE" modifications should be prioritized so you won't lose your vehicle due to being disabled. After that, prioritize on the different ammunition, aiming for "HET", for better anti-air performance. Everything else are extra, but still essentials to upgrading the vehicle. Using Crusader Mk II's chassis - fast with a low profile. High fire rate and a quick reload. Closed-top AAA - the crew is well protected from strafing planes. Extremely dangerous for vehicles with armour of 40 mm or less. Rank III vehicle - suitable for completing missions for warbonds and events. Lightly armoured vehicles like armoured cars, SPAA, and tank side armour can be easy target to the rapid-fire 20 mm autocannons. Limited ammo supply (can be a problem when losing on one point maps). Essentially the armour of a Rank 1 tank. Can only penetrate medium tanks like the Panzer IVs from the side at close range, any more armour will leave the SPAA armament useless. Contemporary to the German Wirbelwind, but with less firepower, less anti-tank ability, and less hull armour. No improvement in firepower compared to the 20 mm Oerlikon cannons on the Armoured Car Mk.II AA. Skins and camouflages for the Crusader AA Mk.II from live.warthunder.com.